Bruce Morrow of New Jersey owns one of 750 1970 GTXs ordered with FK5 burnt orange metallic paint, which was the second most popular color ordered on the GTX. It is also one of 500 which came with the P6K4 burnt orange high back bucket seat interior. This is one of a little more than 25% of all 1970 GTXs that were ordered with factory AC as well as hood pins. The car was ordered with the AM/FM radio which was only ordered on a little less than 10% of all GTXs made. A01 - Light Package had many parts missing, I needed the wiring harness for the trunk light and the light itself. The map light was missing as well. C16 - Console with wood grain panel needed to be replaced because it had a crack on the top. C55 - Bucket seats were one of the few things that were in good condition, as was most of the interior. H51 - Air conditioning with heat, I needed to pull out the heater box and rebuild it, still looking for parts for the air conditioning function. I can’t find 2 hoses that come off of the compressor. Bruce’s GTX is one of 132 in the registry that were painted FK5 burnt orange metallic. 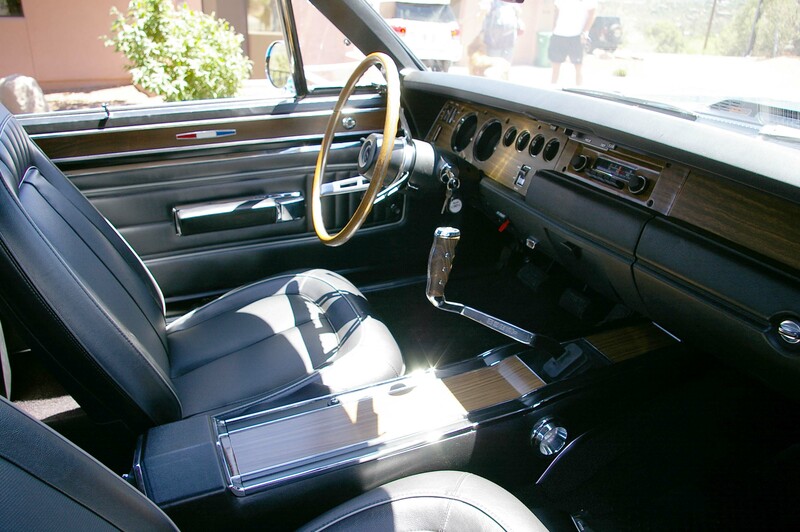 Of those 132 , 49 also came with the 727 automatic transmission and P6K4 burnt orange interior. Only 9 of the 49 had the center console and only 3 had factory AC. Glen Raines' lemon twist 440 automatic.